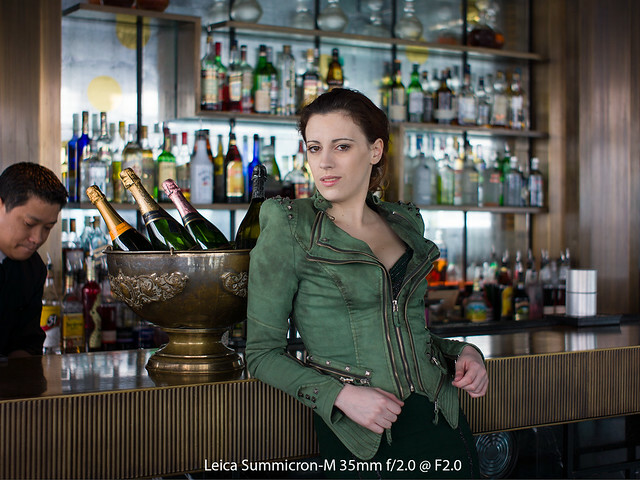 The following pictures were all shot from the same position (with about 3m distance to the model) on a cloudy afternoon at a time, where already the first lights on building arcades started providing a nice "available light" mood. 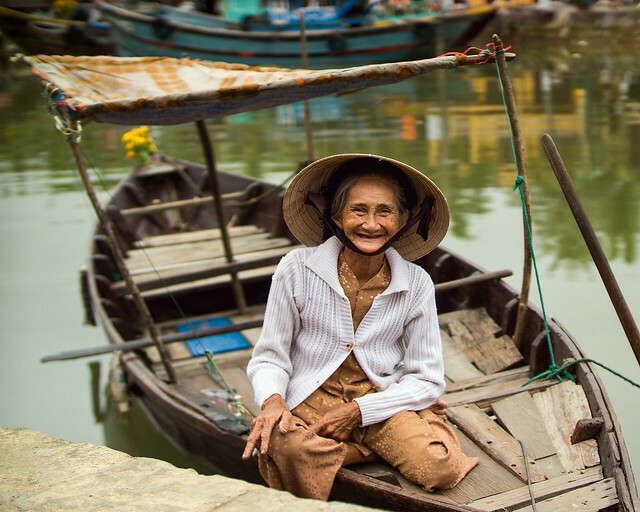 The images were developed from RAW with identical settings for sharpness, contrast, clearness etc. 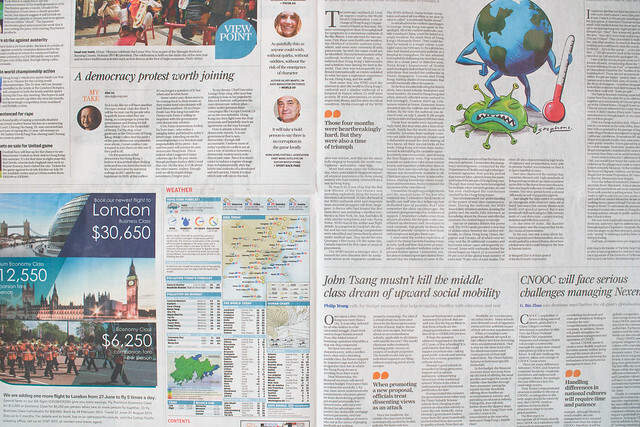 You can click on the images in order to open higher resolutions (including the original 24 MP resolution) and from there you can also navigate to the EXIF-data but we will also discuss 100% crops with actual pixels in the next paragraph. 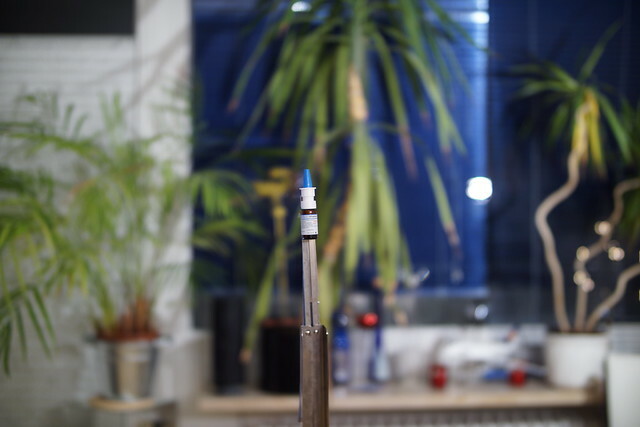 During this sequence the camera could be kept at base ISO and shutter times between 1/80s and 1/125s (from tripod in a sequence with 2-3 shots). 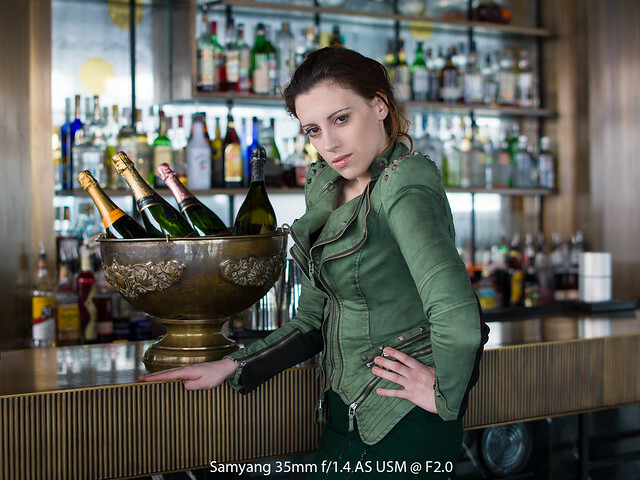 This allows to get an impression about sharpness and contrast that can be reached with these lenses in a real world situation with a lively scene. 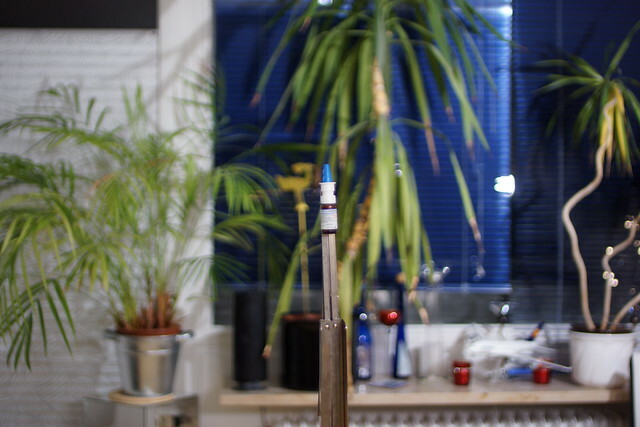 It's the way how I use fast lenses and how I prefer to compare them as well instead of shooting boring MTF test charts. 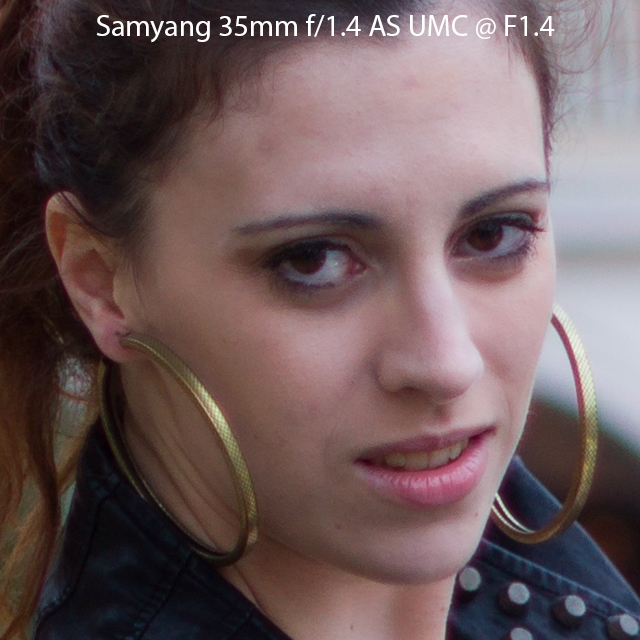 All three candidates provide good center sharpness and contrast already at this extremely wide open aperture. 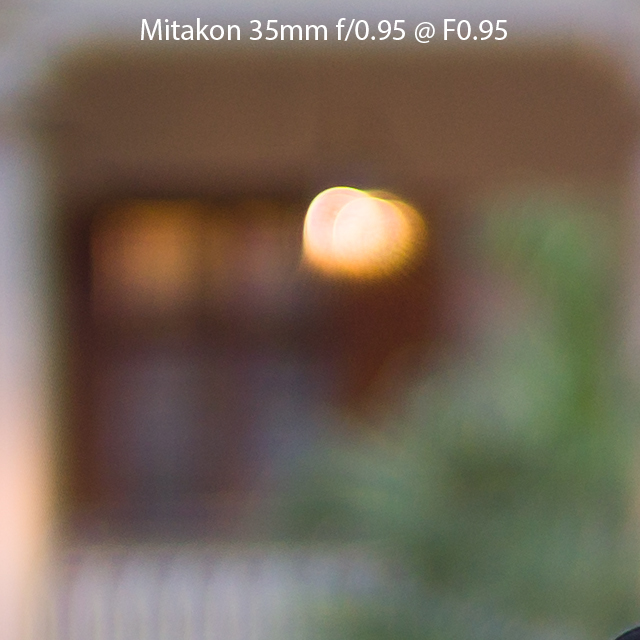 The Mitakon as well as the combination of Canon EF + Speed Booster show some PF / CAs at metallic objects and intersections with high contrast. 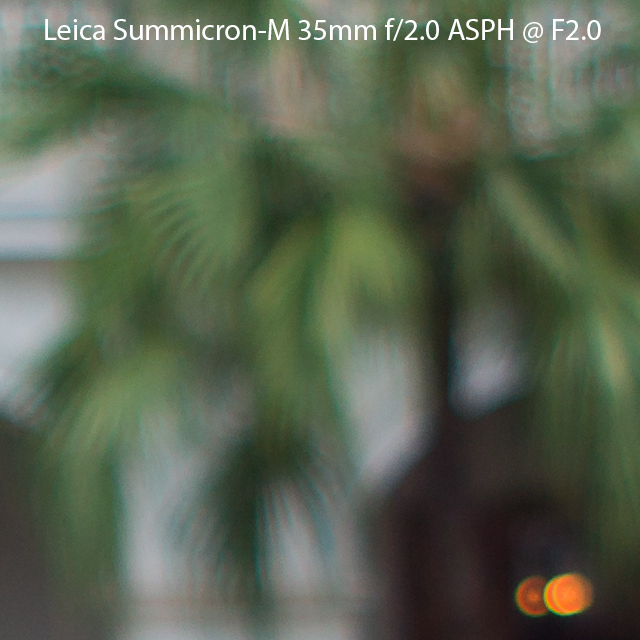 Before we come back later to the edge sharpness, let us take a look at the bokeh which is at least as important for me as sharpness when shooting wide open. 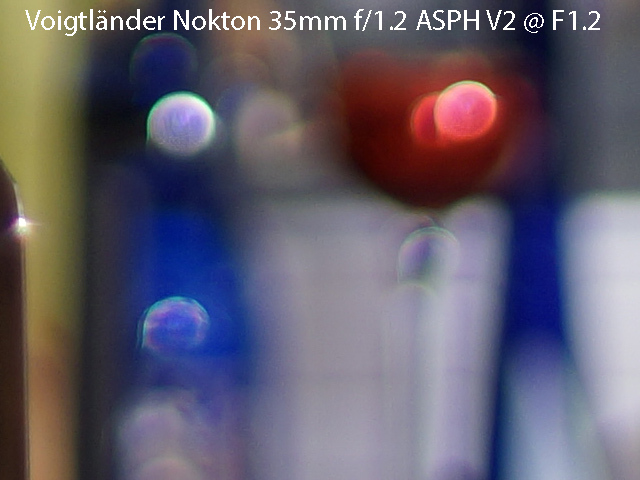 Both the HyperPrime and the Mitakon draw in this area a very creamy bokeh, the HyperPrime shows the most neutral circles of confusion resulting from the background-highlights. 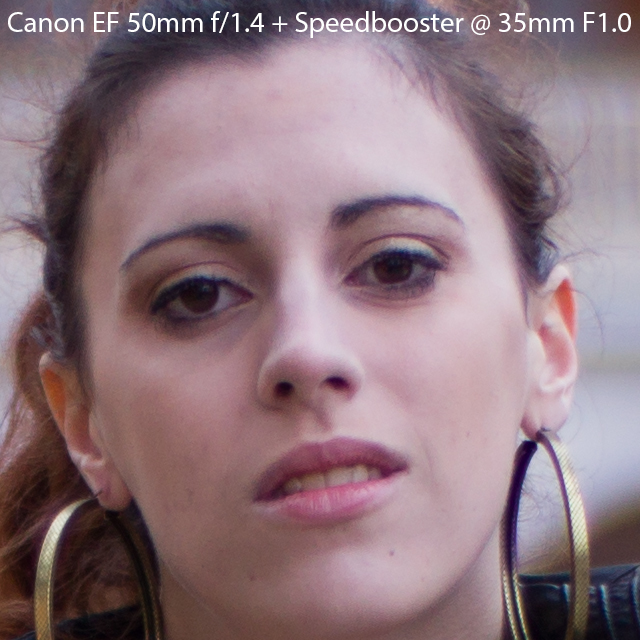 The bokeh of the Canon EF + Speed Booster is more nervous and unsteady but I believe (from other comparisons with and without Speed Booster) that this is mainly caused by the Canon lens. 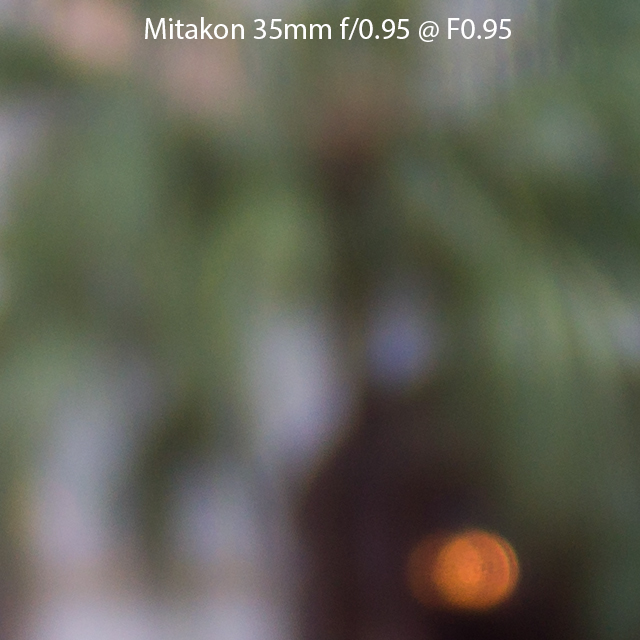 In this off-center area, the HyperPrime continues to show a smooth bokeh with only little deformed circles of confusion, while from the Mitakon the circles of confusion already frazzle a little bit. 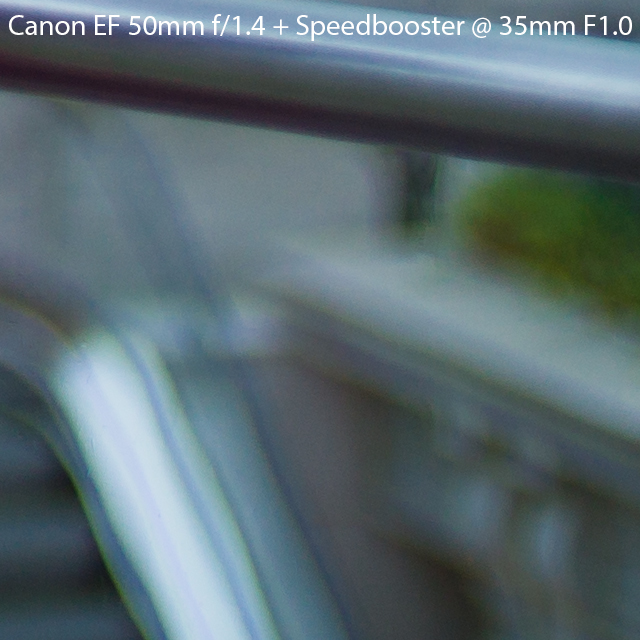 The combination of Canon EF + Speed Booster shows quite turbulent structures and elliptical shaped blur circles. 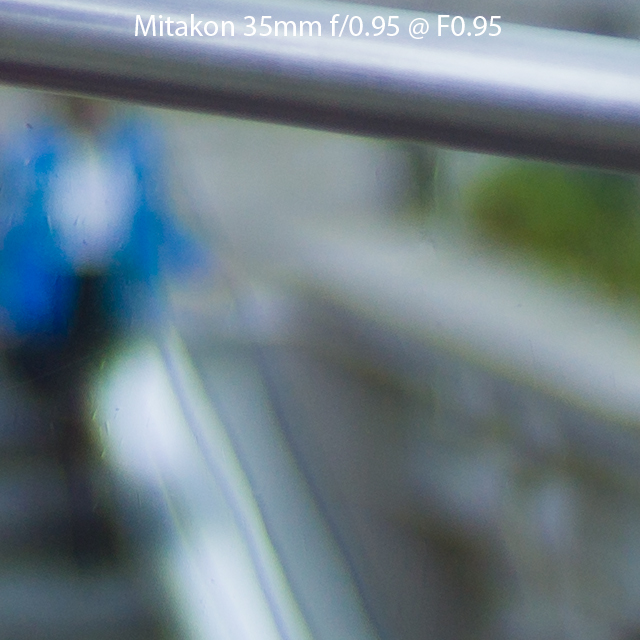 ...we can see that the bokeh of the Hyper Prime stays silky here as well, while the bokeh of Mitakon here (by disregarding the person entering the escalator) shows significantly more unsteady structures and some vignetting is perceptible. 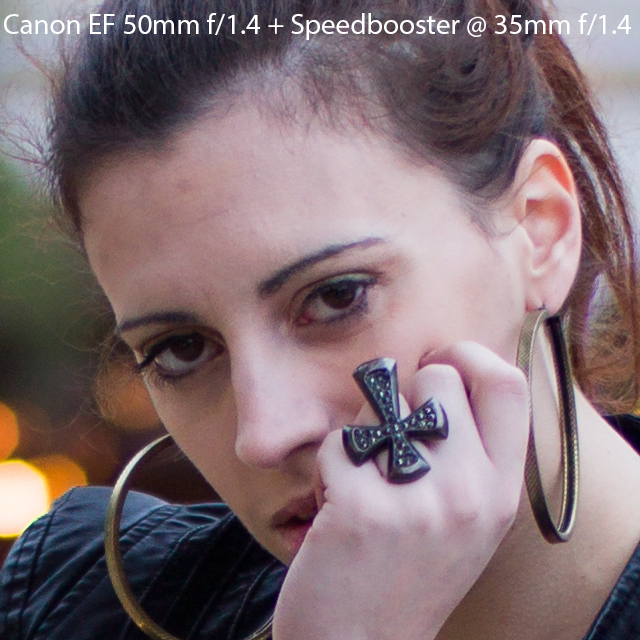 The Canon EF + Speed Booster vignettes as well and in this area show pretty much edgier structures. 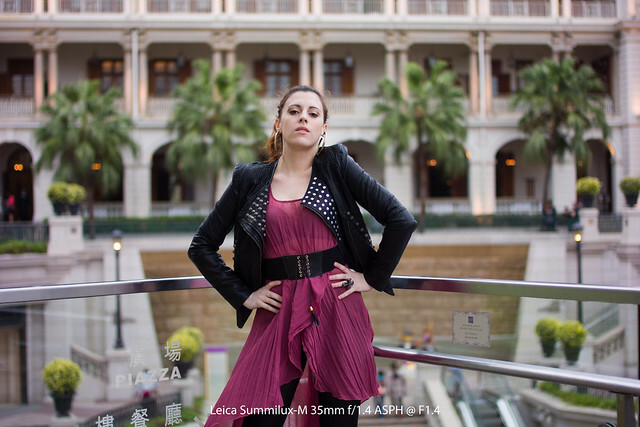 Before we compare these and two other lenses at F1.4, let us take another look at the corners. 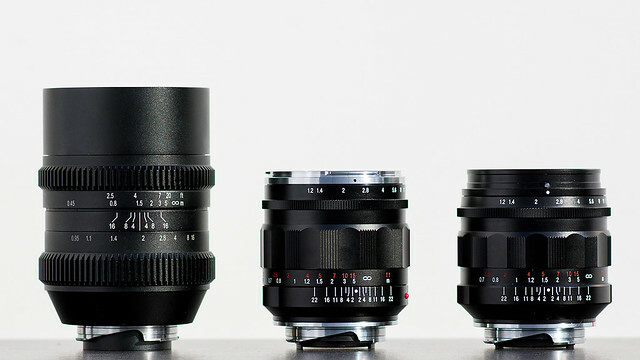 In the corners you see how the effort of the twelve lens elements design and the APS-H coverage of the HyperPrime CINE pays out compared to the ten element design of the Mitakon - which explains also the different sizes of those lenses. If you zoom and scroll to the edges, you see only a little bit of blur remaining - this time giving you an idea which amount of edge blur is added by the Speed Booster. 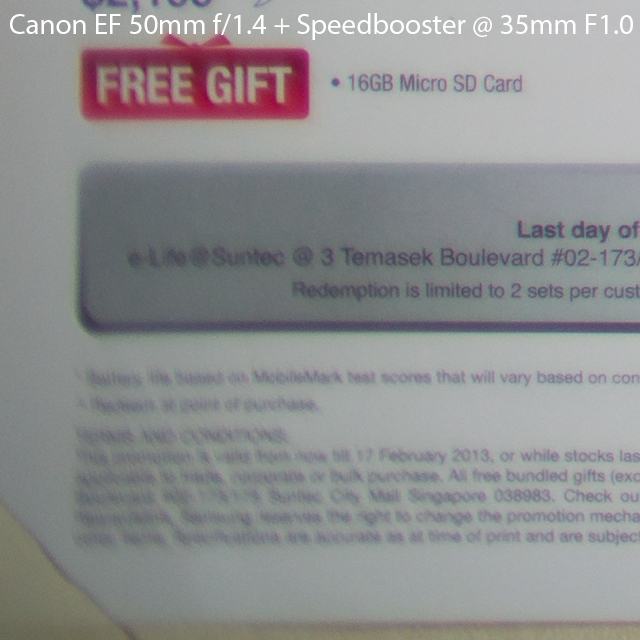 At F1.4, two more candidates enter the game. 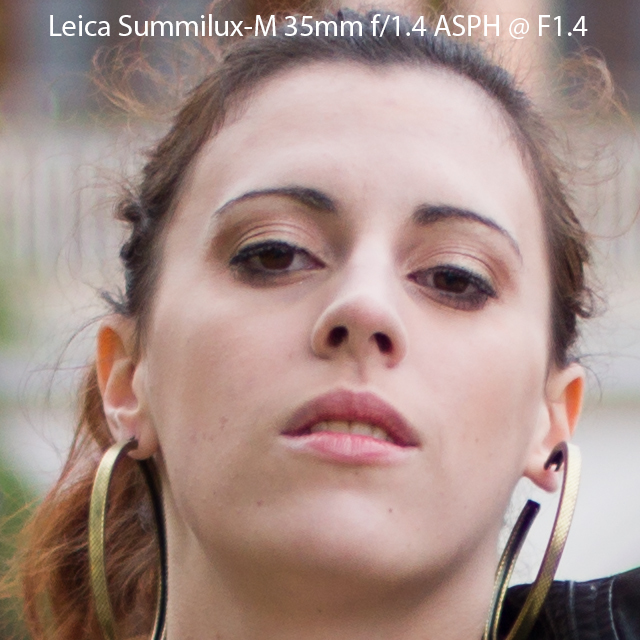 Again you can click on the images in order to see other sizes including the original 24 MP resolution but 100% crops will follow as well. At F1.4 all candidates do a good job in terms of sharpness. 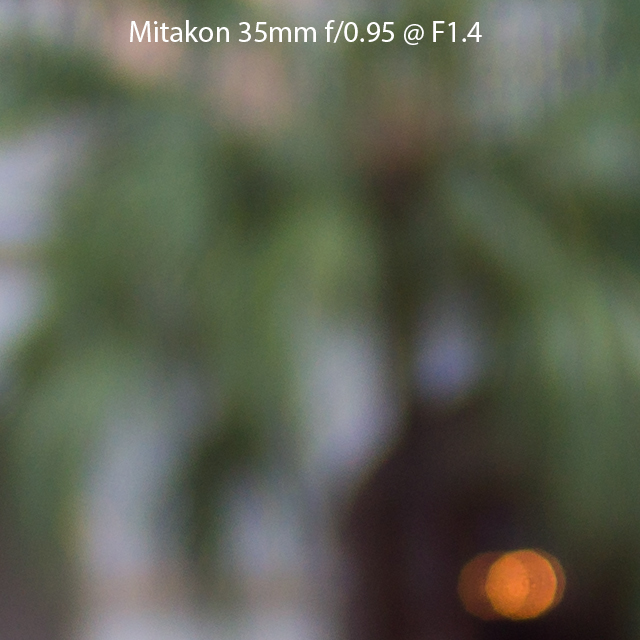 The Mitakon still shows a slight tendency to PF / CAs also at F1.4. 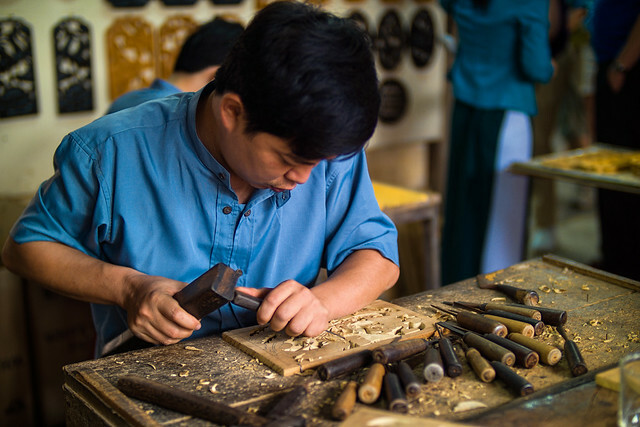 In the Canon EF shot you see that the background highlights already turn to octagons showing the shape of the eight aperture blades. 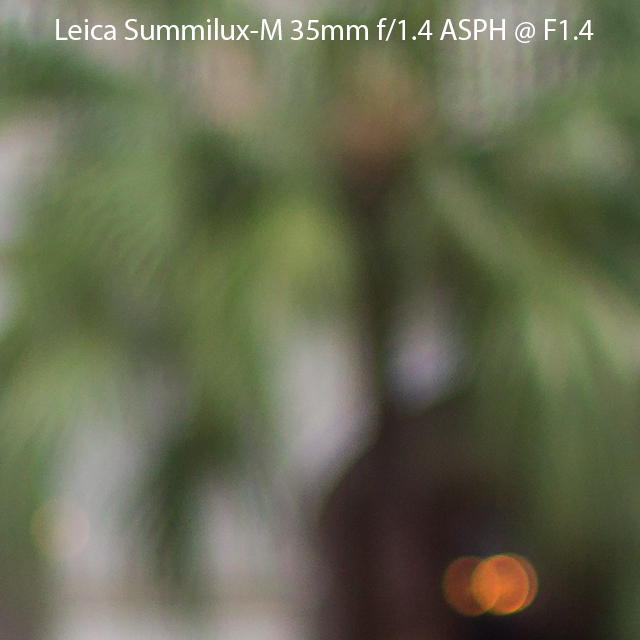 Interestingly, here the bokeh of the Leica Summilux-M ASPH and the Samyang look quite similar. Both are fairly smooth but not as creamy as the bokeh of the HyperPrime CINE and the Mitakon. 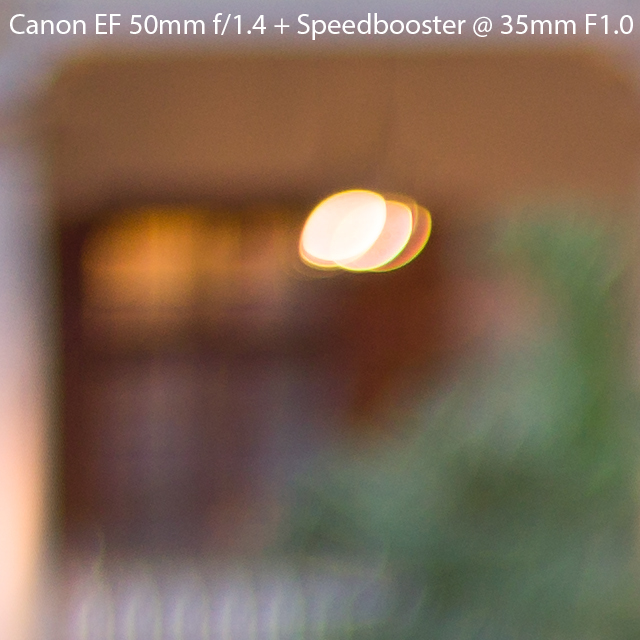 The combination of Speed Booster and Canon EF 50/1.4 shows a more twitchy rendering of the out-of-docus areas, the light-scattering circles are more deformed and - as mentioned in the sharpness comparison before - the circles turn into octagons. 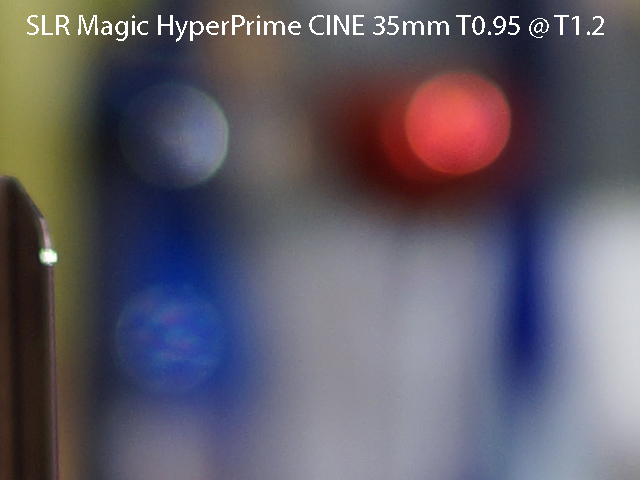 Stopped down, the HyperPrime CINE still preserves almost round circular shapes of the highlight diffraction, while the 10 aperture blades of the Mitakon become already visible at F1.4. For the Speed Booster it should be noted at this point that when stopping down, the images were overexposed by about one stop, so the camera had to be set to compensate this. 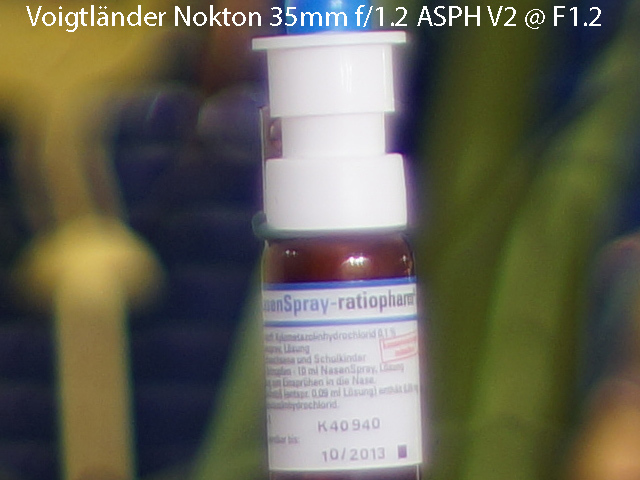 The autofocus did not work with our sample in combination with the Canon EF 50/1.4, although we tried two different copies of the lens. 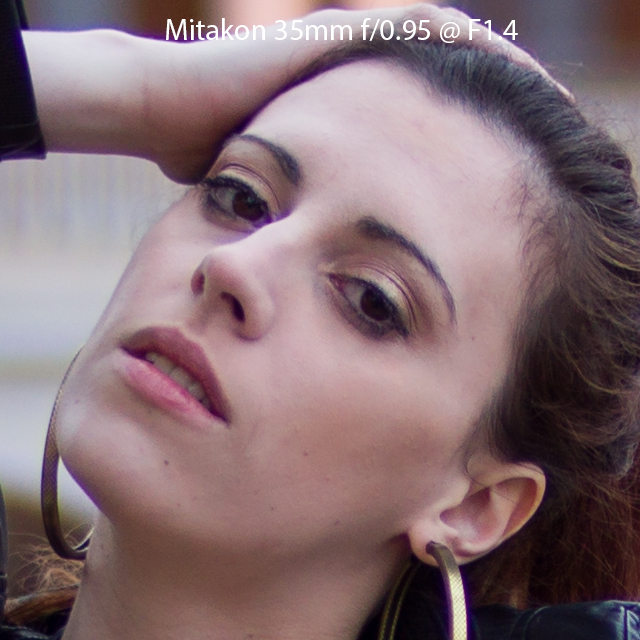 This crop propably explains why at this setting the background already draws too much attraction because the fine structures can not be blurred enough anymore. 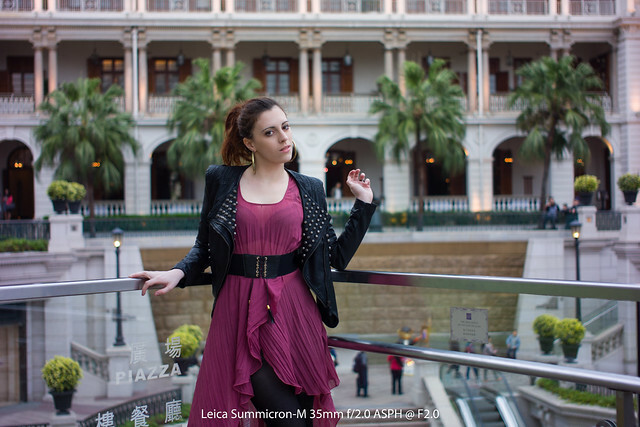 The model in the foreground can not pop out from the background like it was possible at F1.4 or F0.95 with the other lenses. 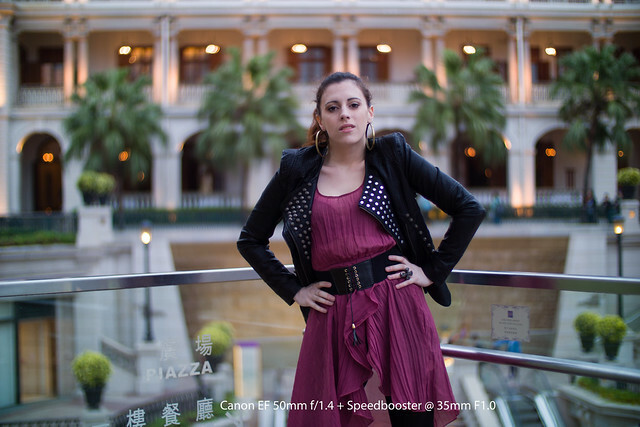 So we choosed a different scenery and a setup, where the camera was positioned closer to the model, allowing to apply more blur to the background through the closer focus distance. 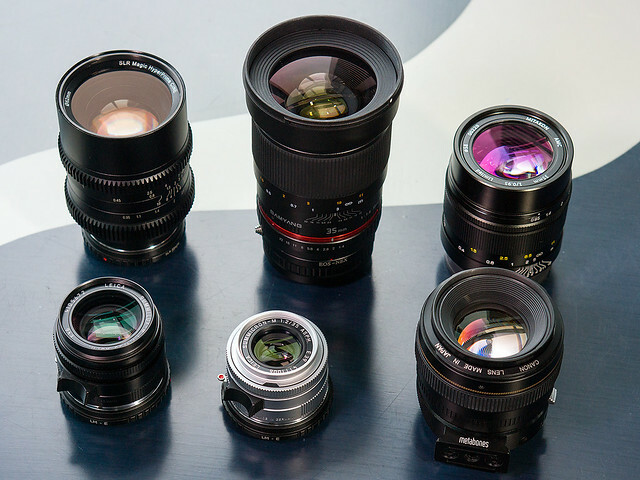 To be honest, all lenses do a very similar job here at F2.0. It makes no sense to compare 100% crops here as the differences are far less obvious than in the first sequence. 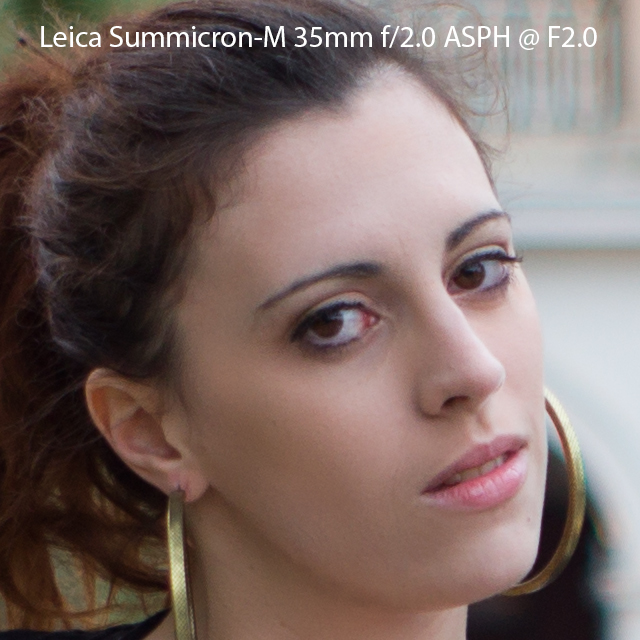 Also here F0.95 to F1.4 has been my favored aperture setting, to get an optimum DOF balance of sharpness on the model and background blur. You can see what I mean, when you scroll back to the title image that was shot with the SLR Magic HyperPrime CINE 35mm at T1.4. 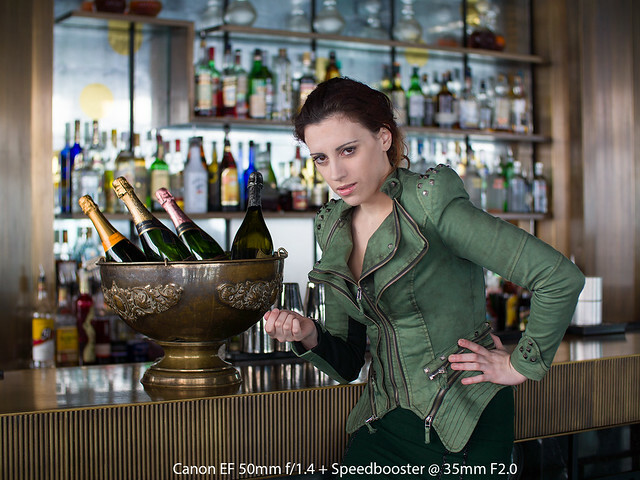 The first thing I learned myself from this comparison was, that for half to full body portraits, on an APS-C image sensor you should choose a 35mm lens that allows an aperture setting of at least F1.4 in order to get the DOF shallow enough for a nice out-of-focus blur in the background and some "3D pop" for the model in the foreground. 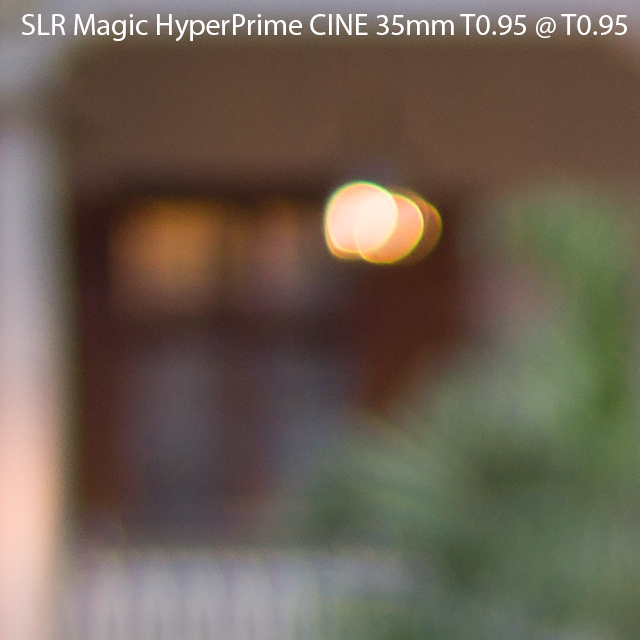 At F0.95 (or F1.0 for the Speed Booster combination or T0.95 for the HyperPrime CINE), for me the SLR Magic HyperPrime CINE is the winner of this shootout. 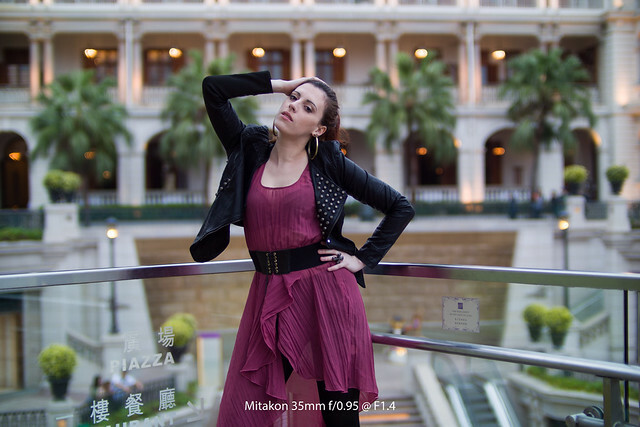 Center sharpness and bokeh of the Mitakon is about comparable but the more it comes to the borders and edges, the more you can see the advantage of the more complex design of the HyperPrime CINE. 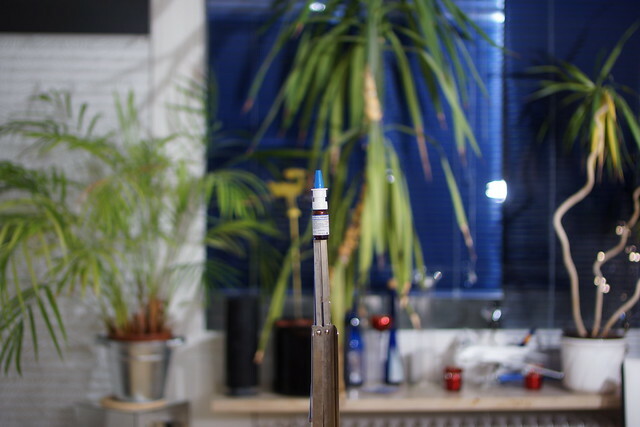 Also the coating of the HyperPrime lens elements seems to be of a higher grade as it shows significantly less purple fringing and CAs compared to the Mitakon. 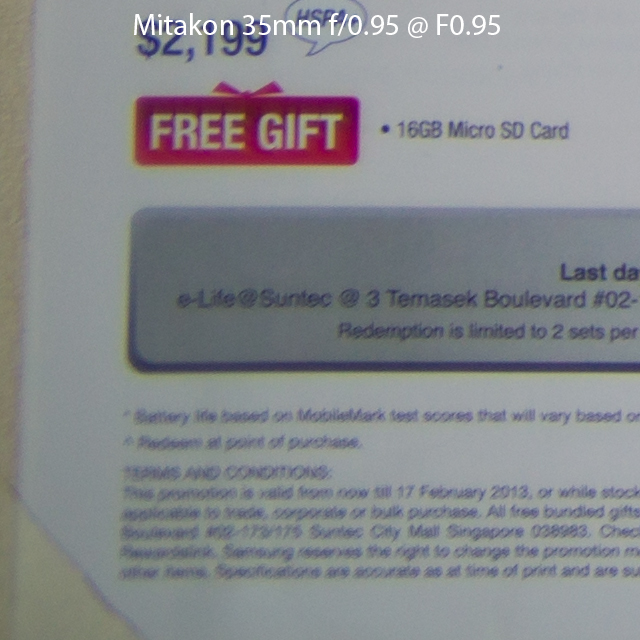 This test also proves that we are talking about different lens constructions - disproving many assertions on the internet, that SLR Magic just rebarrels and resells the Mitakon lens under its own label. 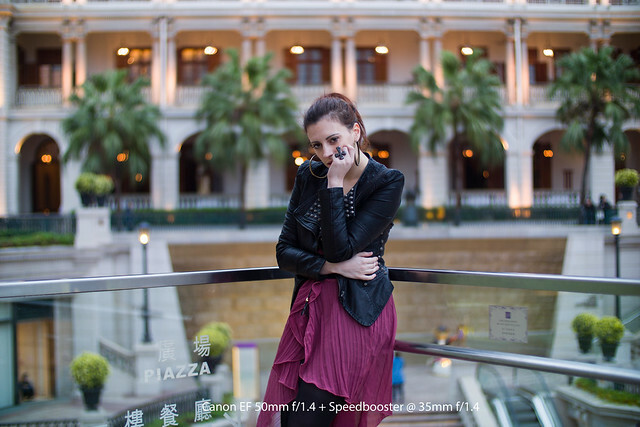 At F1.4 all candidates showed good sharpness and contrast but the Mitakon still produced some PF / CAs. 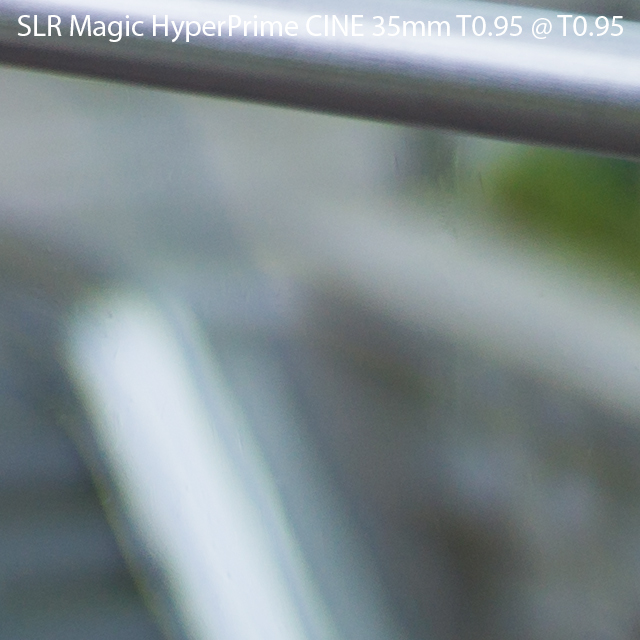 The bokeh quality of the HyperPrime CINE and the Mitakon convinced me more than the bokeh of the Leica Summilux and the Samyang. 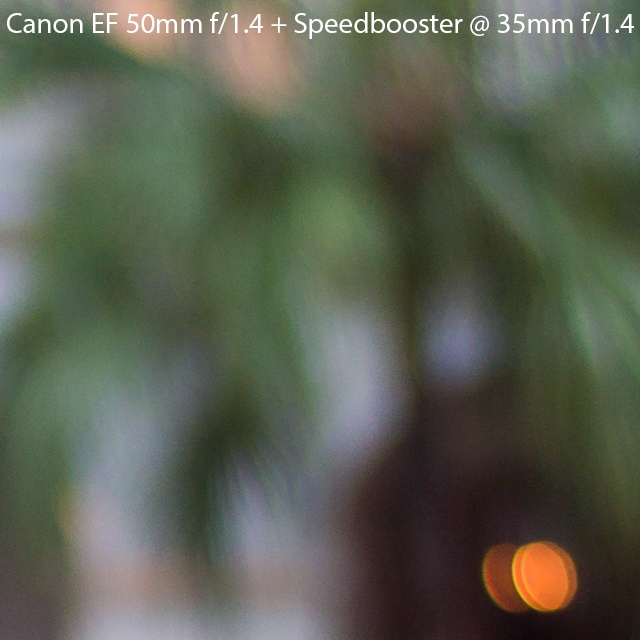 The tail lamp again carried the Canon EF lens when it comes to bokeh. 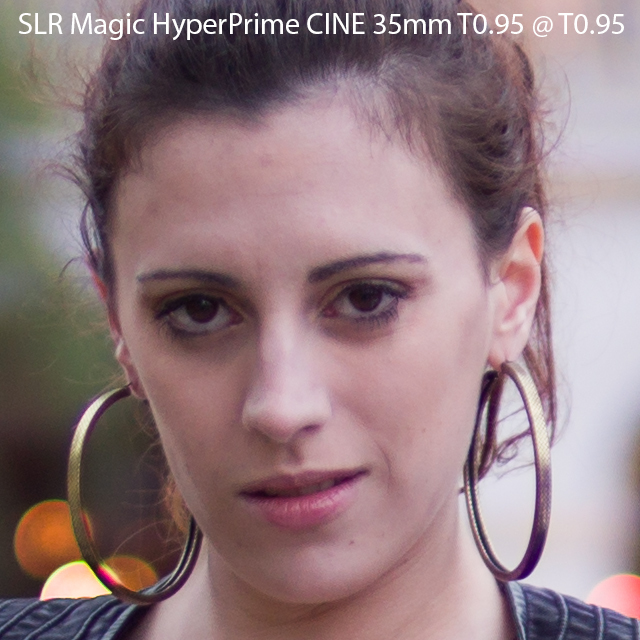 Notable is again that the HyperPrime CINE keeps the shape of its iris still almost round when stopped down resulting in nicely round circles of confusion from the punctual background highlights. 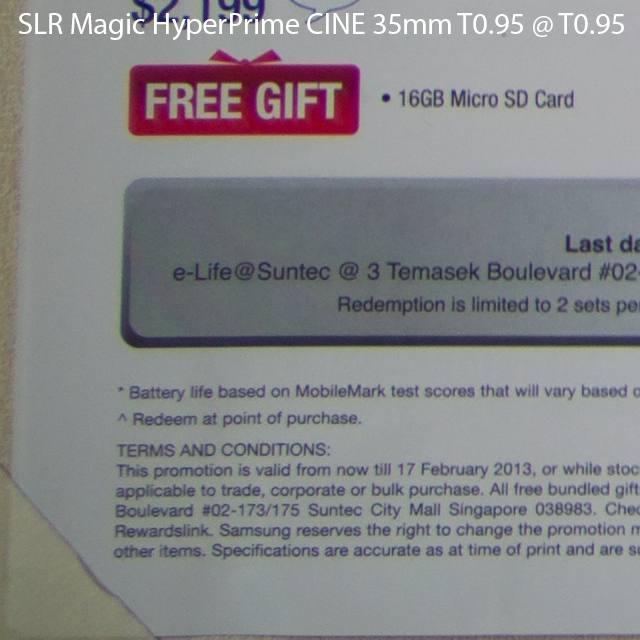 The SLR Magic HyperPrime CINE as well as the Mitakon and the Samyang all deliver a good value for their price. 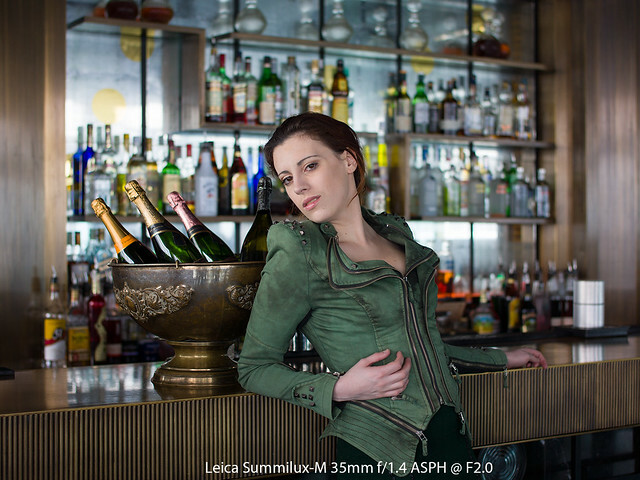 The Leica lenses may show more advantages when compared on fullframe and it is always amazing to see how compact they can build top quality fullframe lenses. 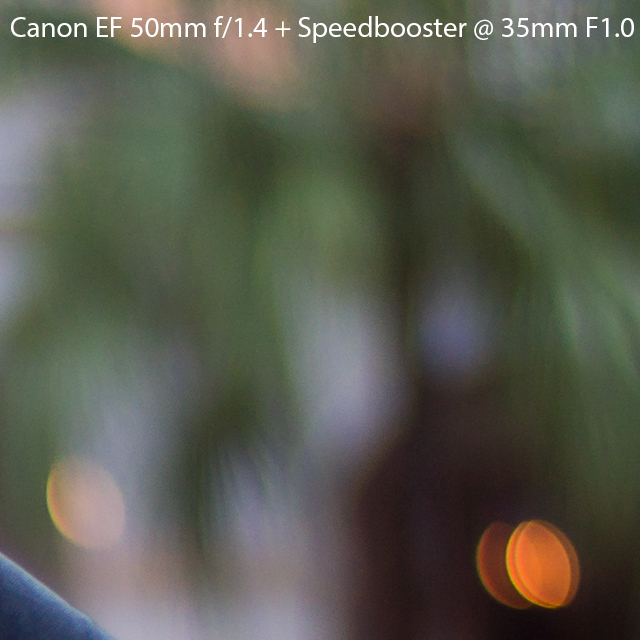 The Speed Booster can be a good investment when you still have a large collection of fullframe DSLR lenses of one and the same system and want to continue using them at the same angle of view and DOF as on fullframe but I hope their coverage of electronic functionality will be increased in the future. 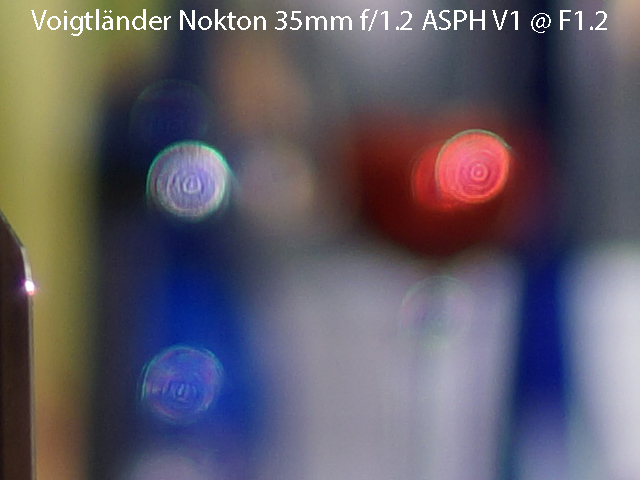 After acquiring a copy of the new Voigtlander Nokton 35mm f/1.2 ASPH II (version 2), I did a short comparison to it's predecessor (version 1) and the SLR Magic HyperPrime CINE 35mm T0.95. 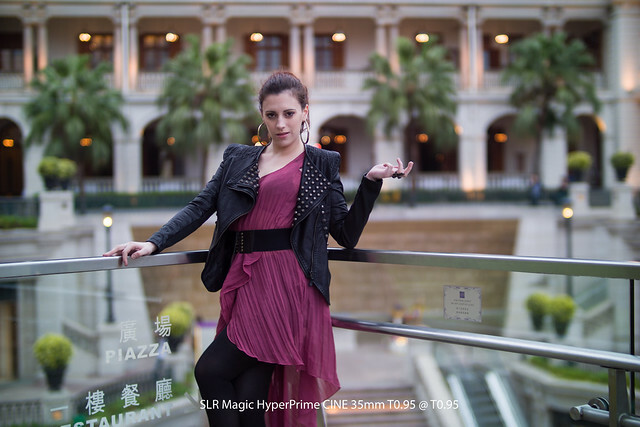 If you want to see more pictures from this test (the HyperPrime also tested at T0.95 and all three lenses tested at F2.0), please check this Flickr album. 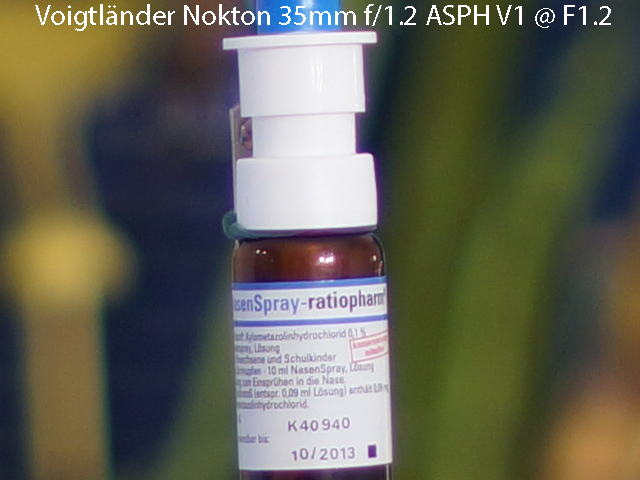 As a result I would prefer the older version I of the Nokton 35mm f/1.2 ASPH over its successor (version II) due to its better sharpness and contrast wide open even though the circles of confusion in the out-of-focus areas of the older Nokton show "onion rings". 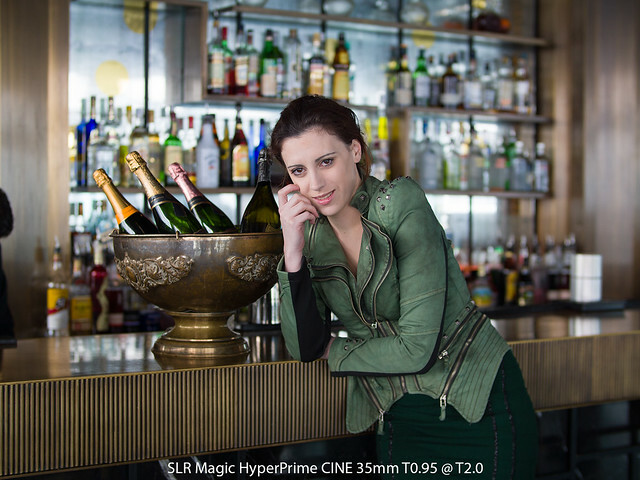 The best result also here produces the HyperPrime CiNE with even better sharpness & contrast than the Nokton version I and much smoother bokeh. 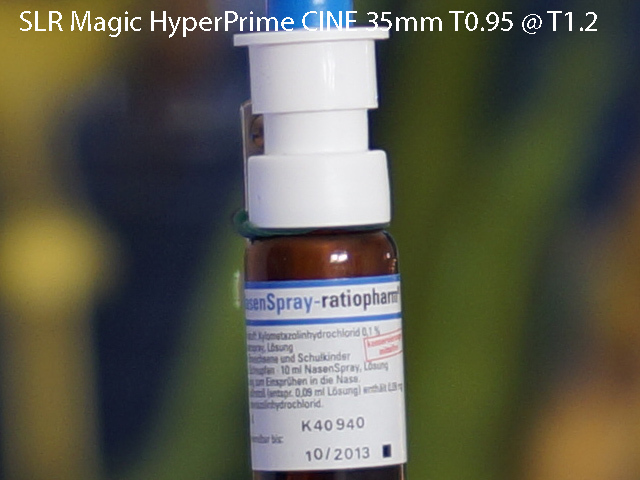 You can find the HyperPrime CINE 35mm T0.95 on auction here.